There is a nice review of MrRobot on Daily PC Game Review who give it 80%. a great role-playing adventure romp that features some nice puzzles. a beautiful game that should not be missed. I am sure you will appreciate all the loving details that went into it; if only there were more games like this little gem. MrRobot gets a 'joystick up' recommendation from Game-boyz who had a few nice things to say. Starscape fan, Dillen, has re-mixed the Starscape trailer to Queen's 'Flash Gordon' track. Nice work! With all these different companies creating game portals, isn't it time the indies got together and in the true spirit of indie-ness collaborated on a portal of their own? Often talked about, but getting indies organised is like herding cats! Well, now we've succeeded. Twenty indies got together and created a single website to promote all their games. Each indie still has his own buy links and so still takes 100% of any sale. 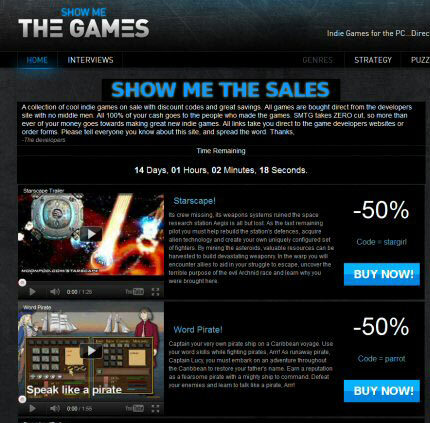 The site randomises the order of the games shown so its completely fair and unbiased. It's like an indie cooperative :) Whereas one developer with one game might not be able to pay for advertising (it often doesn't work financially for just one game), here we can combine smaller contributions into one large advertising budget. If you want to explain to people what indie means then just send them to that website! Thanks for to Cliff Harris of 'Gratuitous Space Battles' fame for organising everything and doing the hard work.